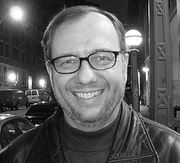 Paul Raeburn is the author of the memoir Acquainted with the Night: A Parent’s Quest to Understand Depression and Bipolar Disorder in His Children (Broadway Books, 2004). From 1996-2003, he was the science editor and a senior writer at Business Week. Before that, he was the science editor and chief science correspondent at The Associated Press (1981-96). He is a commentator for National Public Radio’s Morning Edition, and occasional guest host of NPR’s Talk of the Nation: Science Friday. And he is the organizer of the annual New Horizons in Science writers’ conference, sponsored by the Council for the Advancement of Science Writing. Raeburn is also the author of Mars published by the National Geographic Society in 1998, and The Last Harvest, published by Simon & Schuster in 1995. He has written for The New York Times Sunday Magazine, Psychology Today, The Washington Post, Discover, Popular Science, Child, Self, Technology Review and many other newspapers and magazines. Raeburn is a past president of the National Association of Science Writers and a recipient of its Science-in-Society Award. He has also received the Associated Press Managing Editors Award for excellence, two Deadline Club awards, two Computer Press Association awards, and the John P. McGovern Award for Excellence in Medical Communications from the American Medical Writers Association. He is an honorary member of Sigma Xi, the scientific research society. Raeburn has been a journalism fellow at Stanford University, and science-writer-in-residence at the University of Wisconsin and the University of California, Santa Cruz. He is a graduate of the Massachusetts Institute of Technology, where he received a bachelor's degree in physics. He also studied composition at the Berklee School of Music in Boston, and he plays piano and guitar. Before joining the AP, he worked for the Boston Phoenix and the Lowell (Mass.) Sun. A native of Detroit, Raeburn now lives and works in New York City with his wife, the writer Elizabeth DeVita-Raeburn. Paul Raeburn is currently considered a "single author." If one or more works are by a distinct, homonymous authors, go ahead and split the author. Paul Raeburn is composed of 2 names. You can examine and separate out names.